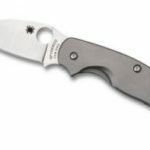 The first Spyderco Paramilitary was a huge success and was widely praised for its design and quality. 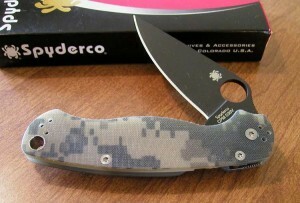 So that begs the question, why did Spyderco decide to bring out a new model? 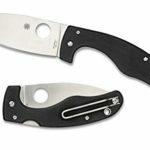 Well according to Spyderco, they believe in C.Q.I. Whats that you ask? Well C.Q.I stands for constant quality improvement, meaning that the guys (and gals) at Spyderco are always trying to improve upon their designs and quality ensuring that the end product is the best it can possibly be. They are always on the lookout for new techniques and technologies which can help them develop the world’s best blade and they have done a bloody good job with the Paramilitary 2. Although quite expensive ($185 on their site, $130-$150 on Amazon) this is one hell of a blade that is definitely going to last you a while. With a price tag this big, you would definitely be expecting a quality blade and luckily Spyderco did not fail to deliver in this regard. 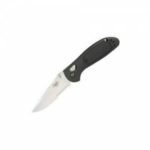 The Para-military 2 features a 3.43″ long blade which if you have read any of my other posts means it is a great size for not only heavy duty tasks, but is also small enough that it can handle the smaller and more delicate jobs. The blade is made out of high quality S30V steel which basically slices through most things like its hot butter. Another great feature of the S30V steel is that it keeps a sharp edge meaning that you don’t have to waste all your time sharpening the damn thing. Compared to the Para-military 1 the Para-military 2 offers a slightly longer blade tip making it more practical for piercing tasks. Also compared to the Para-military 1, the blade is sharper out of the box in my opinion although other then that it is pretty similar (expect maybe a little extra surface on the spine). 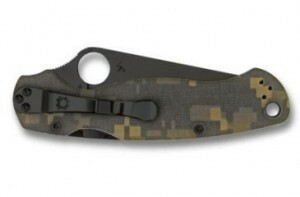 The Paramilitary 2 kept the same handle as the first one, the G-10, which is quite common on many every day carry knives, however, it has been slightly modified. The handle has been slightly narrowed at the end, which allows you to get a better grip as it improves the ergonomics of the handle. However as a whole this handle is really comfortable and the subtle finger grooves allow you to get a really nice grip on it. 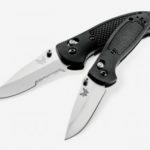 The Para-military 2 also features a compression lock which ensures that once the blade is out that it will stay nice and locked in place and isn’t at any risk of closing on you. Furthermore, the finger choil makes it really easy to open, but at the same time, makes it secure enough that it isn’t going to open on its own. They have also widened the lanyard hole making it slightly bigger. One of the outstanding hidden features of the ParaMilitary G-10 is its heavy duty Compression Lock system. The blade opens very smoothly, but when it snaps into place it is impossible to accidentally close even with heavy use. That makes this knife excellent for battoning firewood, striking a firesteel, or any outdoor task that other pocket knives aren’t designed for. This is a heavy duty knife that will stand up to anything you can throw at it. 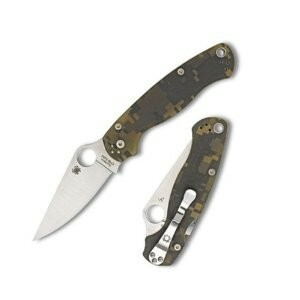 Spyderco engineered, fabricated, and assembled the ParaMilitary G-10 exclusively in America. 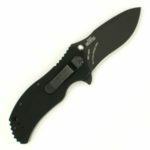 Down to the screws and the steel itself, every part of this knife comes from the USA and was made by American workers. At first glance the G-10 composite handle looks like any other folding knife handle. However the G-10 material itself is chequered, the finger rests are deep, and the grip is thicker at both ends for outstanding handling. Some knives get slippery and want to slide out of your grip, but this isn’t one of them. 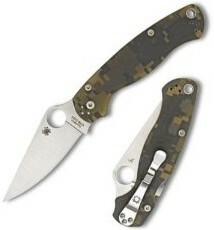 Since the release of the ParaMilitary, Spyderco has largely changed over to using a wire clip instead of solid steel. The handling characteristics of wire are just a little bit better, it clips to your pocket easier and is less likely to snag on your clothes, but the solid clip of the ParaMilitary series is more rugged and resistant to being bent. Larger than a traditional folding knife but smaller than a survival knife, the ParaMilitary G-10 is kind of stuck in the middle. Some people might want just a bit more blade length for outdoor use, but the ParaMilitary is easier to carry as well as being over an ounce lighter than full-sized survival knives. Overall, the Para-military 2 makes the Para-military 1 look like it came out of a garbage box. I definitely recommend this knife for the enthusiast who is looking for a high quality, reliable and sturdy blade. However, it is quite expensive so make sure you don’t lose it or you will definitely be in a world of regret. Spyderco’s ParaMilitary G-10 is an excellent all-purpose knife that is just as at home in the forest or by the lake as it is opening boxes. 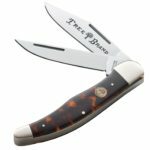 Its medium size and composite handle help to keep the weight down, but the heavy duty blade and locking system weigh more than the average folder. Spyderco has done an excellent job of making a truly all-purpose survival knife rather than just stepping down the size of their Military G-10. All told, the ParaMilitary’s distinct blend of features means that you’ll get the rugged performance of a heavier knife in a smaller, lighter package.